The Prism™ is uniquely designed to provide seating for up to 7 people making this spa perfect for connecting to the people who matter most. 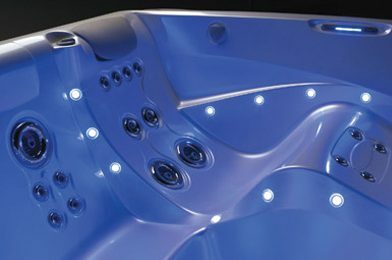 The largest spa in the HotSpring® Limelight® Collection, Prism seats seven adults and features a relaxing lounge, plus an Adirondack-style seat with wrist, calf and foot therapy jets. The footwell includes a powerful, extra-large jet for enhanced foot and leg massage, along with several precision directional jets in corner and side seats. Available to add at any time, the HotSpring Bluetooth Entertainment System can be used with a variety of audio sources. ACE Water Care delivers luxurious, sparkling clean and silky soft water without harsh bottled chemicals. A natural alternative to chlorine. 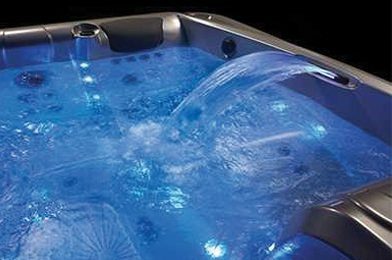 HotSpring is the industry leader in the design and innovation of the most energy efficient Hot Tubs. Fibercor insulation, which is four times denser than standard, and other energy efficient features combine to lock in heat and reduce monthly running costs. Choose your perfect cabinet and shell by clicking on the options below. 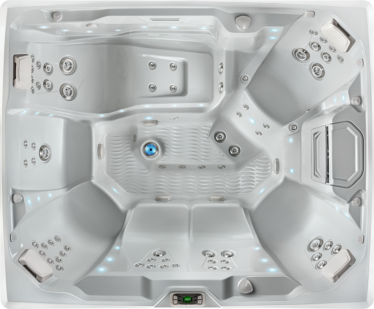 73 jets – 1 Dual Moto Massage™ DX, 4 Combination XL jets, 9 Combination jets, 58 Directional Precision™ jets.